EVANSTON, Ill. --- It’s the dawn of a new era for Northwestern Athletics and Recreation. The Aug. 1 dedication of the Walter Athletics Center and its Querrey Simpson Wing marked the ceremonial conclusion of a multi-year process to provide world-class developmental facilities and better integrate student-athletes into the campus community. The Walter Athletics Center is named in honor of Kimbra D. Walter ’85 and University Trustee Mark R. Walter ’85 JD, whose generous gifts have helped to transform the student-athlete experience. The new home of Northwestern Athletics and Recreation, the Walter Athletics Center will serve as the day-to-day hub for more than 500 student-athletes across all 19 varsity programs. Specifically, the building brings together under one roof the sports performance, sports medicine, nutrition, locker rooms and academic support services student-athletes need to succeed. Coaches and student-athletes from men’s and women’s soccer, lacrosse, field hockey and cross country will be based in the facility. In addition, the Walter Athletics Center will house the football program, including its locker room, coaches’ offices, position meeting rooms, weight room and virtual reality training space. The Querrey Simpson Wing of the Walter Athletics Center, named in honor of Northwestern trustees Kimberly K. Querrey and Louis A. Simpson ’58, recognizes the couple’s generous commitment to improving the academic, social and professional development of Wildcats student-athletes. 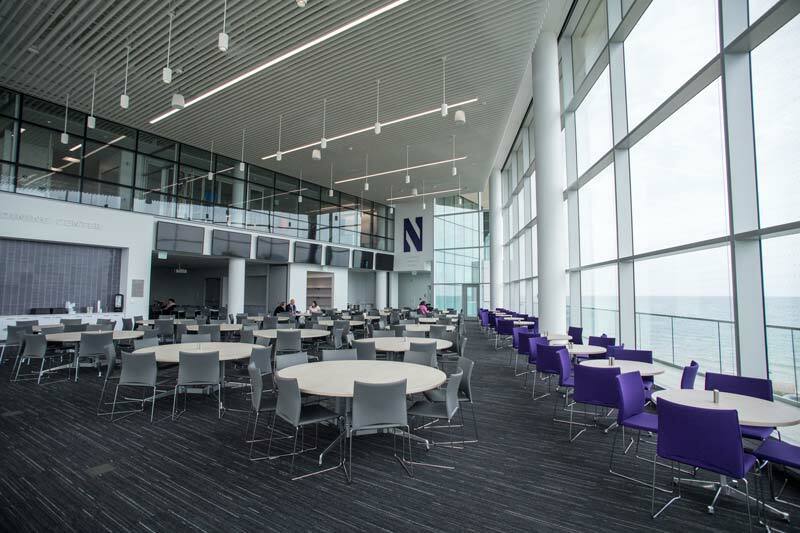 Located on the building’s third floor, the wing includes Northwestern Athletics’ academic services, compliance and NU For Life programs, as well as Nona Jo’s Dining Center, a world-class nutritional hub with indoor and outdoor seating, and panoramic views of Lake Michigan and the Chicago skyline. The Walter Athletics Center is the final installment of a series of new and renovated lakefront athletics and recreation facilities. Jim Phillips, the Combe Family Vice President for Athletics and Recreation, said that before embarking on the ambitious master plan for the lakefront facilities, he and others visited 64 college and university campuses. They found the most successful athletics and recreation facilities were designed to integrate athletics into the student experience, not the other way around. “Our facilities are now found in the heart of campus, alongside classrooms and laboratories and residence halls, allowing more interaction than ever before among our student-athletes and this incomparable university community,” Phillips said. Jared Thomas ’19 shared examples of how the new facilities already have made an impact on his experience as a student-athlete. “Our football team has been privileged to use this building since late June, and it has been a game changer,” said Thomas, a journalism major in the Medill School of Journalism, Media, Integrated Marketing Communications and offensive lineman for Northwestern Football. Mark Walter thanked those who built and designed the building, calling it one of the finest facilities of its type. Lou Simpson spoke about the broad impact of athletics and recreation on the University community. The Walter Athletics Center is the last in a series of new lakefront athletics and recreation facilities to be developed during We Will. The Campaign for Northwestern. Ryan Fieldhouse, Wilson Field and the Mitchell and Valerie Slotnick Family Atrium were dedicated at a special on-field celebration April 5. Lanny and Sharon Martin Stadium and Chap and Ethel Hutcheson Field were dedicated Aug. 26, 2016. In addition, Northwestern Baseball’s Rocky and Berenice Miller Park was dedicated on April 3, 2016. On Nov. 6, 2014, the Northwestern community celebrated the completion of both the 30,000-square-foot expansion of the Henry Crown Sports Pavilion, the primary recreation hub for the Northwestern community, and the Northwestern University Sailing Center on the south end of the Evanston campus. Located within the Henry Crown Sports Pavilion, the Dellora A. and Lester J. Norris Aquatics Center, which features an Olympic-size swimming pool with diving springboards and platforms, was renovated in 2012. The new Welsh-Ryan Arena, the home of Northwestern’s basketball, volleyball and wrestling programs, will open in November. The project also includes the Trienens Performance Center, a first-class practice facility that will enable basketball, volleyball and other Wildcats student-athletes to develop their skills year-round, slated to open in the spring. Mark Walter is the co-founder of Guggenheim Partners, a financial services firm with more than $250 billion in assets under management. He also is the chairman of the Los Angeles Dodgers, is an owner of the WNBA’s Los Angeles Sparks and has controlling interests in other businesses, including commercial real estate, restaurants, media, commercial lending, insurance and infrastructure. Mark and his wife, Kimbra, invest the vast majority of their wealth in philanthropic causes, primarily those focused on social justice, closing the “opportunity gap” for low-income youth, and saving endangered species and preserving wild places. Their sponsored programs include: Chicago Beyond, One Goal and The Academy Group. The Academy Group, founded by the Walters, provides academic support, mentoring and work experience to its scholars during a 14-year journey from fourth grade to career. It also guarantees scholars who adhere to the program paid internships and a job after college graduation. The Walters also own White Oak Conservation, a 17,000-acre animal refuge in Florida, and several wildlife preserves in Africa, where they are funding global efforts to protect endangered species from poachers and habitat loss. Mark also serves on the board of the Solomon R. Guggenheim Foundation, as a director of The Field Museum and as a trustee of Northwestern University, where he graduated with his J.D. in 1985. Kimbra, also an attorney, shares Mark’s passion for conservation and education, serving on the boards of trustees of the Lincoln Park Zoo, OneGoal and the Goodman Theatre. She earned a bachelor’s degree in economics from Northwestern in 1985 and a J.D. from Southern Methodist University. Her father and brother also are Northwestern graduates. In total, the Walters, who live in Chicago, have contributed more than $40 million to Northwestern as part of We Will. The Campaign for Northwestern. The Walters also have made gifts to the University for 26 consecutive years. Mark Walter’s first gift was $100 in 1986, right after he graduated from the Law School. Kimberly K. Querrey is a member of the Northwestern Board of Trustees and president of SQ Advisors, LLC, an investment advisory firm. She is chair of Artis Naples, a member of the Council on Foreign Relations and a member of both the board and the executive committee of the Big Shoulders Fund. Louis A. Simpson, an alumnus of Northwestern, is also a University trustee. He is chairman of SQ Advisors. He also serves as a director of VeriSign and trustee emeritus for the Urban Institute and the Museum of Science and Industry. Simpson’s son, Ted, is a 1996 graduate of the Kellogg School of Management. Querrey’s niece, Melissa, is a medical student at Northwestern University Feinberg School of Medicine. Extraordinary supporters of the University, Simpson and Querrey have contributed more than $164 million to Northwestern throughout We Will. The Campaign for Northwestern. They are also members of NU Loyal, the giving society recognizing consistent annual giving to Northwestern, with 12 consecutive years of giving. Support for athletics and recreation is part of the University-wide fundraising campaign, We Will. The Campaign for Northwestern. Funds raised are helping realize the transformational vision set forth in Northwestern’s strategic plan and solidify the University’s position among the world’s leading research universities. More information on the Campaign is available at wewill.northwestern.edu.